*In Rio, it was a trio of young musicians singing "The Girl From Ipanema" while my wife and I were on that very beach. *In Jordan, it was riding on the back of a sure-footed (we hoped) donkey stepping up a mountain path while 2 feet to our right was a sheer drop to nothingness. *And in India, it was the sight of three people on a motorbike--a man, woman, and child, with the mother holding a baby with one hand. It just typified the crowded cities, the crush of people, the intensity of simply living in that country. 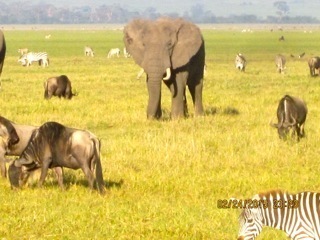 And now we've just come back from a safari in Tanzania. And, yes, I'll think of the luxury tents as part of our Abercrombie & Kent, aptly named Tanzania Safari in Style (abercrombiekent.com). Of course, there were the animals--hundreds, in herds and in packs, just passing us by without looking up from their grazing or munching on leaves. Also, the remarkable insight and passion of our guide and driver as our Jeep bounced along a narrow path while we sought out animals. 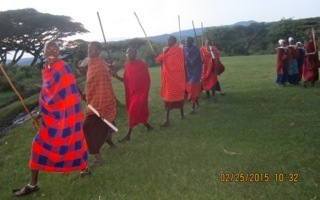 But for me, the moment was at the Ngorongoro Crater cultural site, where we spent an afternoon among a Masai tribe. 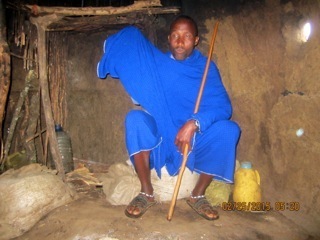 Once we were inside the Masai world, we were swept up into the culture and the moment and the immediacy of their lives. That is hardly unusual on an Abercrombie & Kent tour--I had seen the company's ability to take us into the culture of a country, and not as an outsider. Our small group of 10 had spent much of the day in the Crater, a UNESCO World Heritage Site. We caught up with a couple of young lions, a lazy hyena, wary wildebeest and nervous gazelles. We even had lunch on a prairie--white tablecloths, South African wines. But in the village, we were transported into a world that, quite simply, cannot even be imagined by someone from the West. Off the rutted road, there were a group of huts and a few dozen Masai. I assumed the huts were made of mud--but no, I learned, actually from cow dung plastered around sticks, and dried, like adobe. A fellow in his early 20s came up to my wife and I and introduced himself. He said he was the son of the tribal chief. "My father has many wives and I have many brothers," he said. We bent down to enter one of the huts. It had no windows, only one six-inch round hole. In the middle of the floor were a few stones in a pit. That would be the fireplace/stove/light source. There was a spot behind me about five feet deep. That was the bed. And here, in the middle of a vast open plain, where zebras and elephants roamed, I made a new friend. I asked him about his father--whether he had a fixed number of days he would spend with each family. "No," was the response, and I sensed almost sadness. "Sometimes it would be for a few days, sometimes for a few weeks." I told him of my upbringing in Brooklyn, New York, and that my parents were divorced and that I rarely saw my father. "That is sad," he said. "I know." He had gone to university, rare among the Masai. Indeed, it is only in recent years that most of the youngsters even attend grade school. But we were lucky. We were to visit one. When we left the hut, we looked at the crafts they said were made right there--beaded necklaces, bracelets, woven shawls. While we were shopping (after negotiating, of course), we heard something that sounded like birds, getting closer and closer. Suddenly, out of a clearing a dozen men and women appeared. They had been doing the chanting. The men formed a semi-circle and one began to jump. I had seen strong young men do remarkable jumps from a standing start--it's one of the tests that a pro football team gives its rookie players, and I had written about the New York Jets for The New York Times for many years. But these guys were really special. After they took turns jumping, the young women responded with another sort of dance, shaking their shoulders. It turns out they each were imitating the mating dance of a local bird--the male showing off his athletic skills, the female responding with an "I'm impressed" shake. The women in our group were invited to join the female dancers and everyone had their hands on one another's shoulders and smiled. Finally, we went to a schoolroom--which gave new meaning to a one-room schoolhouse. This had more than 60 nursery-school children. The walls were bare except for one blackboard that had the ABC's on it. Children took turns walking up to the board and reciting the alphabet. Was it just for our benefit? I wondered. 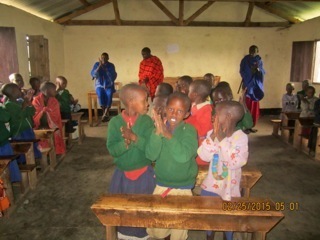 The children sang a song for us, and applauded our presence. We applauded back. Then we were off to our next adventure--but I think all of us will remember Tanzania for its people as much as for the safari experience.